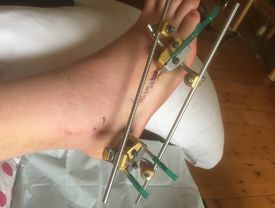 On 14th April 2018 I was run over by a tractor as a result of the accident I suffered a comminuted fracture of the tibia and fibula in my left leg and dislocated fourth and fifth metatarsal and broken cuboid bone in my right foot. Whilst both injuries were fairly substantial my consultant informed me that had I not been wearing my safety boots my left foot could have been broken as well as the leg because the steel toe was squashed presumably from the tractor wheel, and that my right foot could have been far worse were it not for the steel toe cap and the metal in the sole of the boot helping to hold everything in some semblance of shape before my arrival at A&E. Also the wide fit Buckler lace up safety boots you got me during my recovery have been a godsend for getting out and about during my recovery. My wife was having a clear out today when she came across my old shoe box. I have had these boots for five years now & not a blister, a pinch, wet feet or any glitch with these beautiful beasts... at all. Hard as nails you say? Indeed. Best boots in the world your customers say? Absolutely no doubt I say. After five years then, image attached, my 'working slippers' are an overnight success. As an ex military man, I apologies for keeping them polished! So tired of my Amblers hurting my feet…I’ve been wearing these all day and I love them! I’m so pleased with the comfort and the quality of my new Buckler boots, I have been so fed up with my previous Ambler dealers hurting my feet and wearing out in next to no time. I am overwhelmed with the comfort of these boots, for a pair of boots that I wear day in day out on the farm and tending to the horses I wanted value for money, which these boots so are! I have NEVER EVER had a pair of dealers that have been so comfortable and not rub even when wearing them in! I forever will buy Buckler Boots! We have been known to extol the virtues of advanced technology fabrics used in contemporary boot linings but in truth the best material for lining a boot is leather and there is no better weather for proving the point than the weather we are getting right now. Read what USA based Bob Ramsey posted on our Facebook page earlier this year. "These things are the nuts. 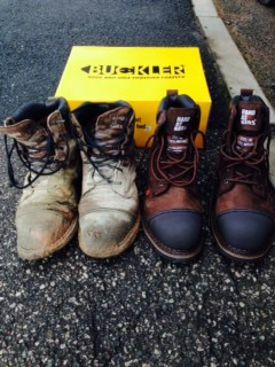 #buckbootz"
I've been buying safety boots and safety wellies for years from Buckler Boots. Here's a photo of, IMO, the very best safety wellies we've ever bought......no more cold/wet feet.... so thanks Buckler Boots...... for literally putting the boot in! It might be cold and miserable but at least my feet will dry and warm. Best boots I've had @bucklerboots"
"Just bought a pair of SAM safety Shoes Largo Bays S3 HRO WRU SRC from my local Alty's store (Preston, Lancs). Having had some trouble in recent years with comfort, I would just like to say a big thank you for producing a shoe that, to me, is not only comfortable but looks great. Well done Buckler Boots. Streets ahead of the rest......"
We recently posted on our Facebook page regarding the importance of safety footwear in the workplace. A story backed-up by one of our previous stories from Kyle Howard. Mark jumped in to tell us that the same thing had happened to him! He continued to tell us: "I would have lost both my feet if it wasn't from your boots, as quoted from the specialist in A&E. 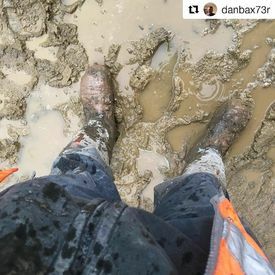 I won't wear anything else other than Buckler Boots"
Lucky for Mark he was wearing our Hard As Nails B750 waterproof lace boot! And we can see why. 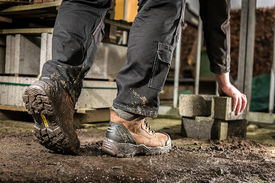 Our Largo Bay safety footwear range offers the same durability, comfort levels and safety spec that our users have come to expect but with a look that wouldn't be out of place on the street. Body and Sole Together Forever and Ever! @baileybodyshopltd posted the pics and text below on Instagram. @paulscott24 hit the nail on the head with his observation. We are happy that Bailey did get his money’s worth even if it’s not quite what we had in mind when framing our unique guarantee. There would certainly be antislip deterioration! 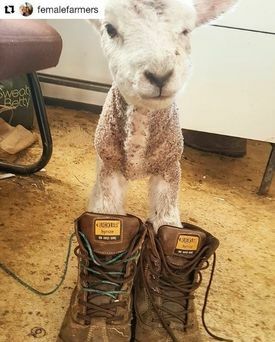 Enjoying his new farm boots! Back in June 2016 I was hit by a tractor which ran over my foot. Fortunately for me I had bought some Buckler Boots no more than three weeks before. Doctors told me if I hadn’t had the boots on I would have lost my foot. It still isn’t better and they don’t think it ever will be but at least I can walk. "Hard wearing in the toughest environments"
I just want to say that I have used Buckler Boots from when I was a student studying horticulture and agriculture and now working as a full-time mechanic for the RNLI. 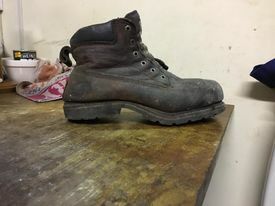 I have had different sets over the years the last set 2 pairs I have used are B550SM and BSH008WPNM and they’re are the best safety boots I have used and are hard wearing in the toughest environments. 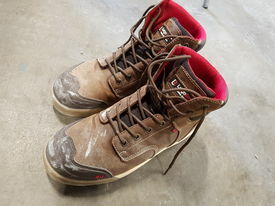 Other boots that I have used are B1151SM and B750SMWPWG. The boots on the right are 14 months old with day-to-day wear and the ones on the left are 5 months old. You’d think they are nearly new! I arrived in New York last week with a brand new, unworn pair of your Buckshot boots. I was advised stout footwear was the order of the day because they had just had the first snow of the winter. I spent 4 days with my daughter, showing her the sights of NY. The only way to do this is to walk, and walk we did every day. Not a blister, rub, sore foot or damp sock occurred by the end of the four days. A true testament to the most comfortable boots I have ever worn. My first pair are 2 years old and still going strong but a little scruffy and soiled for an overseas trip. So I now have footwear to last me well into the next decade. Marvellous. When our Scottish Regional Sales Manager, Scott Guyan visited HRN Tractors' Turriff depot, he was greeted with glowing reports of our Buckshot2 BSH002BR safety lace boot. 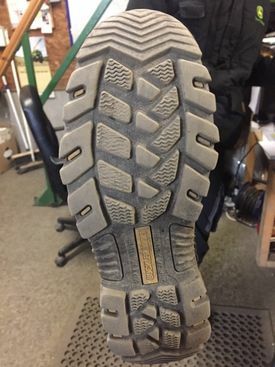 "I've been wearing them for 2 months and there's been no breakdown of the sole, the scuff toe is immaculate and they're very flexible, are great for driving and offer excellent grip in the wash bay." Thanks for your feedback Keiran and we hope they continue to serve you well! When manufacturers of products say "they are the best" it is all too often their fall-back line. Either they are too idle to explain the facts or they have little or no fact to support the claim. After three winters in the UK and unforgiving French countryside I can't actually prove that your Wellingtons are the better than all the rest but after a lifetime of living with some of the more well known makes I can say that yours are far and away the best for me. Comfort in walking over tricky ground, warmth, almost weatherproof and durability. They are joy to wear and walk in unforgiving weather. Buckler, you have a lot of Welly. The [BBZ6000] boots are a superior product and the answer to much that has been wrong with previous waterproof safety footwear with which my team has been issued. I purchased a pair of high leg zipper boots (BSH008WPNM) from Buckler boots and have never worn a more comfortable boot in my life. I’ve been wearing these every day for months and the soles have not begun to wear like others I’ve purchased in the past and they remain waterproof at all times no matter how harsh the weather. Well after 12 months of daily use, my dealer boots are worn out, new ones purchased, your boots are the best I have ever worn! Darn fine comfy boot that don't crack, split or wear down to the steel after a year on my knees. I have used the boots for a week now and I must say that is the best work boots I have had for years. 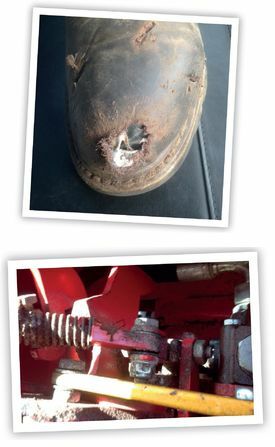 Pete Clark from Buckler Boots dealer BRM Ltd of Northallerton, North Yorkshire, contacted us recently with an account and pictures of an incident in which his Buckler Boots B1150’s protected his foot from serious injury when it got trapped in a wood processor. Back in December we turned the focus on the latest injury statistics from the construction and agricultural sectors - when you see Pete’s boot you see how real the risks are. I have had them (BBZ6000GR) for 8 1/2years in all weathers. Done concreting in them, building works, lots of walking with the dogs in all weather's and even painting as you can see. I just want to tell you how great these wellies are and have been fantastic value and long lasting. I might get another 5 years out of them! I called into CJ Cox this morning and spoke with Rex and Sam. Sam advised me that he has got a new pair of B1150's. A customer had left a horse box in the yard which was in the way so he decided to move it. As he lifted the towing end, it came across and went over his foot. Fortunately he wasn't injured but his boots have suffered a little. I'm on my third pair of Buckler boots. They are the most hardwearing long lived boots I have owned. The comfort and support they give to my feet are excellent. I would just like to take this time to thank yourselves, on making excellent boots. I purchased a pair of Buckshot boots in 2013 from my local dealer, these boots were worn daily on a mixed farm through muck, dust and rain. Last year on August the 4th they went on to prove they're the best boots I've ever had. 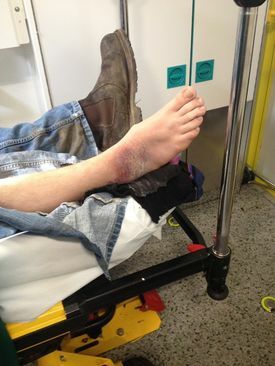 I was involved in a horrific farm accident when a concrete panel dropped from chains and crushed my leg and foot. The leg was broken in 5 places and the foot and ankle had multiple fractures. I was airlifted to the RVI Newcastle where the boot was cut off and received surgery on my leg. The fractures in the foot were left to heal. If it wasn't for the quality of your boots my foot could of been so much worse and my recovery so much longer. I'm now back on my feet and looking forward to being able to go back to work soon. So thank you for saving my foot and please keep making quality boots. Davids story can also be read here. 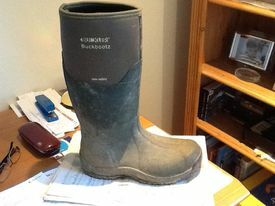 Just to say how pleased I am with my BBZ5020 Buckbootz wellingtons. We farm on the Brecon Beacons so require comfortable, hard wearing boots. Having tried most leading brands over the years with disappointing results, leaking and splitting over a few short months, I am delighted to report that your boots are now as good as new after 10 months of wear. Please keep up the good work!! I have recommended your boots to many others already. Ms. Alison Renton, East Sussex. Mr. Matthew Wilson of Channel 4’s The Landscape. Lee of Total Building Materials Ltd, in Goring-by- Sea, West Sussex. Chris Wells of RLG Tyres, Heathfield, East Sussex. 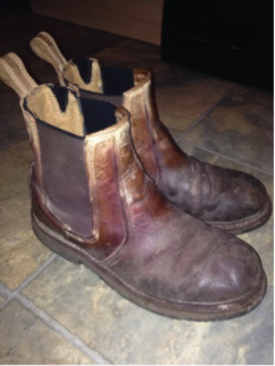 “My boots are 2 years old and still in great shape. I wear them nearly every day and during winter I wear them in a salt yard whilst gritting. Most boots last 4 months with salt on but this will be the third time wearing them gritting and no damage. Had to buy some new wellies the other day. 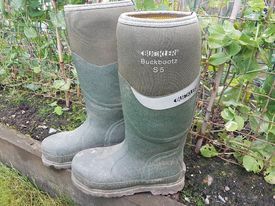 My Nora Dolomit wellies (in green) not being in fabulous condition, not being safety rated and being very cold to wear are to be pensioned off a bit early and put into summer use only. They normally last about a year before cracking so it will be interesting to see how these Buckler Buckbootz compare. Nora make a Megamax safety welly but since I wear other Buckler boots I thought I would give them a go! I purchased a pair of Buckler B705WP boots about 10 years ago - the best boots ever, they are still going strong considering I worked on a pig farm for the first 3 years of having these boots. Now I use them for hill walking. Some time ago I was lucky to get my first pair of Buckler Boots, and I must say they are fab. I would regard Buckler Boots as the most comfortable hard wearing boots I ever had, and wouldn't consider any other boots from now on. I was outside working in the yard, helping a customer get a 12' timber gate out of the rack when I dropped it on my foot and the customer kept pulling the gate out resulting in bottom of the gate cutting through the boot - your boots saved my little toe from being severed from my foot! I've owned 2 pairs of your B900 S3 boots, since 2008 and I have worn them pretty much every day. They have been outstanding, it is a pleasure to find a product in this day and age that lasts when it is truly tested - very impressed, I tell all of my friends. The Buckler boots I purchased about 12 months ago are quite battered now, due to the massive workload on them from construction sites, but nevertheless they are the most comfiest, toughest, hardwearing boots I have ever purchased, I will definitely be buying more when these go, thanks very much all at Buckler boots! Having just arrived back from walking the dog, they are comfortable out of the box. Buckler boots are really at the top, for quality products and customer service. Many thanks for your help. I would like to compliment you for the best shoes i have had for the last 9 years. I have a pair of B1150's. I bought these in 2004 and have been wearing them almost every day since. Just wanted to say thank you very much for looking after my feet for the last eight years - as you can see I've worn them every day! My boots 2 years old and still in great shape. I wear them nearly every day and during winter I wear them in a salt yard whilst gritting. Most boots last 4 months with salt on but this will be the third time wearing them gritting and no damage. Thanks Buckler! In 27 years of HGV driving, Buckler boots are the most comfortable hard wearing and stylish boots I've ever put on my feet - please do not ever stop making your non safety dealers. Although these boots are classed as non safety, I did on one occasion while delivering fruit and veg to a wholesale market in west London, have both drivers side wheels of a 2 ton forklift run over my right foot toes and the only injury sustained was crumpled leather to the toe section of your brilliant B1100 boots, which easily pushed back out! Thank you for an outstanding product. After a lifetime of buying and wearing work boots your B1150SM boots are the most comfortable I've ever had. 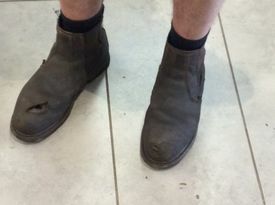 I have just bought my third pair of B1150 boots - I wear them for 12 hours a day on the milk round delivering to 1,000 customers - just like a pair of slippers. Thanks! I just wanted to e-mail to thank you for the good service I received recently when I experienced a problem with my Buckler boots. I bought them from Aarons in Halifax approximately two years ago and was delighted to find that you truly do stick to your guarantee promises - my boots were quickly replaced. (It was explained to me that since this style was originally made, a problem was identified with the design and this has now been rectified.) An excellent service from both manufacturer and retailer. I would not hesitate to recommend your product - they are extremely comfortable, hard wearing and well worth the money. Just want to tell you that I've been working on different agricultural/water projects all round the world for years, and have tried all the competition Cat, Timberland, Redwing etc., etc. And every time I get back to Scotland buy a pair of your dealer boots. My current pair was brought to me by my sister, May 2005, when she came to visit here in Belize and have been worn almost daily since. Getting a bit past it now and not posh enough for the 'dancing' but they are still on my feet as I write. Fantastic value! Can't you open a dealership here? Myself and husband live on the moors of west Penwith. We have in the past purchased Hunter boots. We purchased a pair of size 11 and 8 Buckbootz mens neoprene wellies for the winter. We would both like to say that these boots are the business and I would highly recommend them to all. We did pay over the odds as we got them from our local store and could've got them a lot cheaper via the internet, however they are a darn good purchase and well worth the money. As I walk a lot in mine as I am fed up of ruining my leather walking boots. Thanks for your attention and thanks again for producing a great boot that knocks the spots off the useless Hunter wellies. 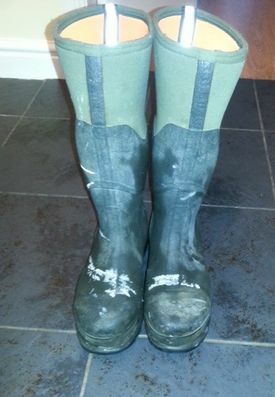 I have had a pair of your rigger boots for a couple of years now, and recently had to replace my wellies, so off I went to my local Cornwall Farmers depot to see what they had available. Included in the offerings was a pair of Buckbootz wellies with the neoprene tops, and having tried several other pairs on offer I winced a bit at the price tag and tried the Buckbootz on. No contest - paid up with a smile and off home. These wellies are the best ever. I've had them on for up to 14hrs some days, working along river bank, walking miles and on occasions sitting still for long periods (which is when feet are most susceptible to cold) with warm dry comfy feet, and never feeling "I'll be glad to get these off". On top of that I recently had a serious operation on my shoulder, and am unable to drive, and unable to tie laces. 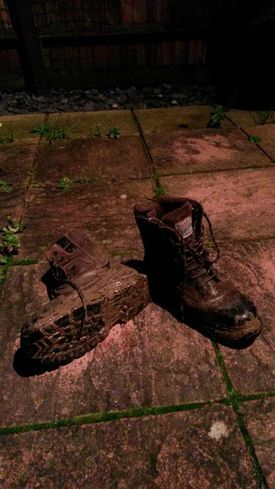 My wonderful Buckbootz have become my 'daily ride', walking quite a few miles each day, whatever the weather. 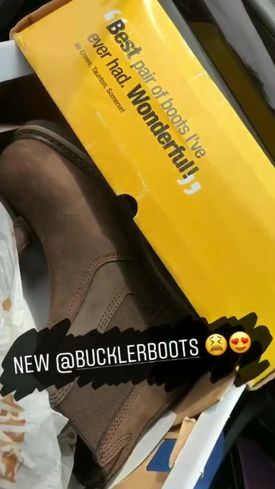 I just wanted to say thanks for making such a brilliant product, and promise that next time I need boots it'll be another pair from Buckler, without wasting my time looking at any others first! I would like to thank you the quality of your boots. I wear the Buckler fully leather lined B420 SM boots and they are absolutely superb. I have just worn my first pair out, and would now never purchase anything else. I work twelve hour shifts, and I have never worn anything more comfortable. My new pair were purchased by my manager for me, and my colleagues in the warehouse all want a pair. Cheers once again. I definitely will be buying more of the Buckbootz they are the best boots I have ever worn, and believe me I go through many pairs of wellies on my farm! I think I have tried most and these so far are the best. I cannot feel any stones under foot, they are very warm and even in the hard frosts we have just had I could not feel any cold through them (I suffer badly with chilblains so this is important), in fact when I take them off my legs get cold! They are light weight and give an added bounce to my walk as they are so well padded in the insole, they are a snug stretchy fit and very easy to get on and off and easy to bend my ankle in. They are very safe on slippy surfaces plenty of grip and very thick sole without being clumpy so should last for a long time. Even though they are not steel toe capped my horse trod on my foot and it didn't hurt (makes a change!). I am going to test them out for their first lambing season in two weeks I spend a lot of time in mud and kneeling down so the stretchy calf will be perfect no more pins and needles in my feet. I strongly recommend these boots to anyone requiring warmth, comfort, leak free with added spring in your step! How many women say they are in love with their boots?! The most comfortable shoes/boots I have ever owned. Thanks for the (by a long way) most comfy wellies I have ever had, the BBZ5000. I have worn Buckler boots (B301SM) for years in my Blacksmiths Business, and have found your boot great for my job, warm and hard wearing. I have been very pleased with the way they don't wear out. I am 63 now and everyone says I will die with my boots on as I am always wearing them - I even play motorcycle football in them, very good for kicking the ball - A great product! The best boots I've ever owned - or will ever own. Donald Edwards, Dundonald Fencing Ltd, Dundee. I work for Parker Building Supplies at Haywards Heath and was supplied with some of you dealer boots (with toe caps of course) the most comfortable I have ever worn with your boot socks of course. Due to the bad weather, I have now ordered some of your hard as nails rigger boots, special order ('cause we don't stock them). What greater advert than an employee wearing the goods. Always had trouble in this industry with my boots because I have high arches, but yours are the boot to wear, without the blisters to wear the boots in. Will always look for your brand name now! I also wear your trousers as the extra pockets are so useful. Phil Whiting, Parker Building Supplies, Haywards Heath, West Sussex. 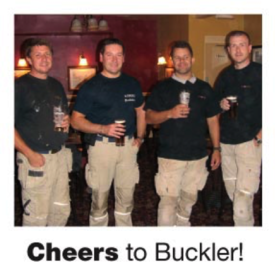 Cheers to Buckler! For the best boots and workpants we have ever had. And that includes Dewalt, Dickies, Jobman, Cat and Snickers. The best safety boots I've ever had. I've worn Buckler B1100 Dealer Boots every day for 14 months. They've been great and there's still plenty of life in them. I purchased a pair of your Buckler Gold range of boots approx. 10 months ago. I have worn these boots daily for my work since and I can confirm that they are the most comfortable and best made boots I have ever worn. I have sung their praises far and wide. 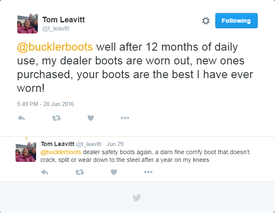 I've worn Buckler Leather Lined boots every day for 14 months. Most comfortable and longest wearing boots I've ever had. I used to wear Dickies. Buckler make great work boots - strong, comfortable and warm. Our footwear has to withstand oil, grease, diesel, petrol, cow manure and nails to mention just a few routine hazards. I insist that all our employees wear Buckler. I just had write to you and tell you that our boots are the most comfortable boots that we have ever had. They are perfect in every way. Mr. and Mrs. Lee, Bridlington, East Yorkshire. I've had CAT and Dickies before but these are far and away the best boots I've ever worn. I've had them for over two years. 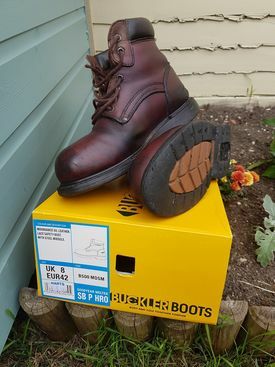 Hello Buckler, just bought my third pair of B1200 boots, these boots are second to none the next best thing to my own feet. 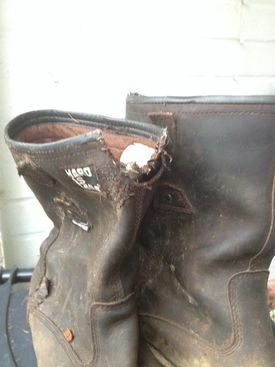 I purchased a pair of B700 in July (2004), these were purely for walking with my three spaniels. I have found the quality of this boot to be top bracket and have since purchased B3002 and B1100. Truly quality products! I have worn a pair of black Buckler B200 boots daily at work, for the last three years. They are simply the most comfortable and best fitting safety boots I have ever worn. Excellent quality. Best pair of boots I've ever had, Wonderful! Now have a pair of your boots and I am extremely impressed!! I have worn them for two weeks and they are amazingly comfortable even over a 12 hour day. I'll definitely be back for more! The most hard wearing and comfortable safety boots I've worn. With the type of work I do, the soles always tear away from the upper at the toe, but even after many months of non-stop punishment the Buckler soles are still intact. My Buckler LITE boots are great; very comfortable. No problems with grip and they don't trap muck like other boots I've had. 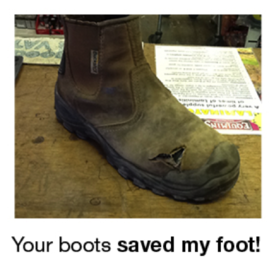 I have worn my Buckler B300 Safety Boots every day for the past twelve months. They have served me well. Thank you for selling a quality product. Mr. Rod Thomson, Barry, Angus. These Buckler Boots are the best value boots I have ever had in 40 years of hard work. Peter Andrew, Thirsk, North Yorkshire. Best work boots I've ever worn. I've had three different Buckler Boot styles. They've all provided excellent comfort and value. Mr. Matthew Housley, Mansfield, Nottinghamshire. May I take this opportunity to let you know how sturdy and practical these boots are. I wear them all the time, work or in the office and when I'm on the motorbike too. So you can see I am at a loss without my Buckler boots! I know friends and colleagues that feel the same too. I have had your boots before, and have always found them to be superb and very comfy, as well as very rugged: Far more so than the likes of Timberland, CAT and Wolverine. I found your staff incredibly friendly and helpful and full of useful information, so it seems that your customer service is second to none as well. A breath of fresh air!! Long may you succeed!